Yesterday at the High Court, another hacking trial began, this time over the past exploits of those in the service of Mirror Group titles - yes, that means all of the Daily Mirror, Sunday Mirror, and Sunday People - over a period of several years starting in 1999. As the trial does not involve a jury, the restrictions on what may be reported are less strict, and the first thing that came out of yesterday’s events was the scale of illegal activity. The Guardian’s headline tells you all you need to know about that: “Phone hacking at Mirror titles was on industrial scale, court told … One journalist hacked phones of 100 celebrities every day for 18 months, says barrister acting for victims including Sadie Frost and Paul Gascoigne”. There was more - much more. “In the first hint of the true extent of phone hacking at the three titles, the court heard that the former Sunday Mirror journalist Dan Evans hacked about 100 celebrities every day from 2003 to mid-2004 … Such was the reliance on phone hacking for stories that one senior journalist was desperate for Evans to create ‘an enigma-type machine that would automatically crack pin codes’, the court was told”. What kinds of stories might have been obtained by phone hacking? Ah well. Here we are indebted to the BBC, which, whether accidentally or deliberately, served up a few tasters on last nights News At Ten, which is still available to view on iPlayer (HERE). One need not sit through the whole bulletin; the relevant coverage comes just over one minute in. And Zelo Street regulars will see a very familiar headline at the 1:14 mark. 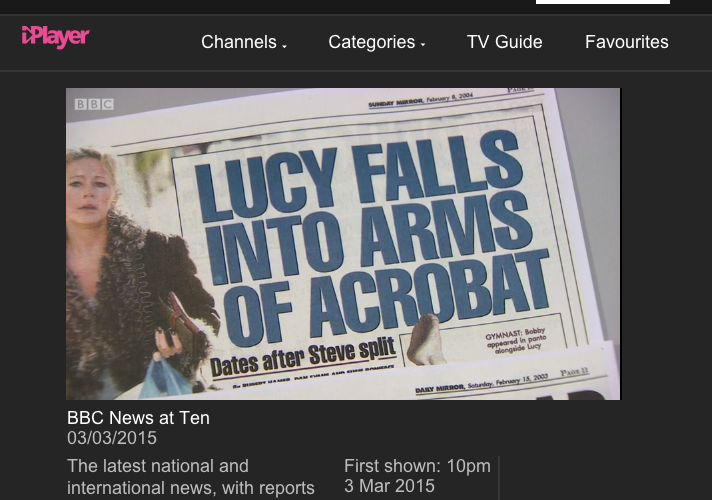 “LUCY FALLS INTO ARMS OF ACROBAT”, it reads. The paper is the February 8, 2004 edition of the Sunday Mirror. You cannot see the by-line on the BBC video, but, as I’ve previously covered the very same story, this can now be revealed: the two names in the frame are Dan Evans … and Susie Boniface. That’s Susie Boniface as in Fleet Street Fox, who said of phone hacking “I’d do it for a minor shagging story”. And here we have something that fits the bill, splashed all over the BBC News At Ten. 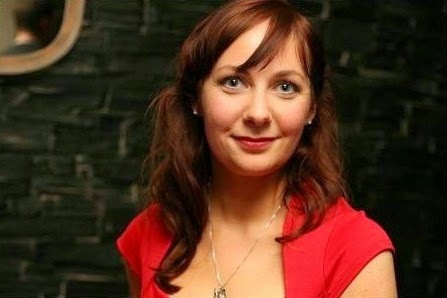 The “Lucy” in question was Lucy Banjamin, who has successfully sued Trinity Mirror for hacking her phone. The article told “Two weeks ago the couple ordered £108 worth of booze for Lucy's [hotel] room at 12.30am as they partied through the night”, of Ms Benjamin’s relationship with gymnast Bobby Hanton. Knowing that said booze had been ordered, perhaps by seeing it delivered, is a perfectly plausible explanation. But being able to place a price tag on it is rather more difficult. Susie Boniface has said “I’ve never seen anyone hack a phone, never known anyone to be hacking phones, nor ever been asked to hack a phone”. Well, the BBC appears to be suggesting that her Lucy Benjamin story was the result of phone hacking, which, as Spike Milligan might have observed, puts her in a very difficult position. The story came from a hack. But its co-author didn’t know. That’s most interesting.